20 x 24 Silver Gelatin Photograph, Open Ed. 24 x 20 Silver Gelatin Photograph, Open Ed. 20 x 30 Silver Gelatin Photograph, Open Ed. 24 x 20 Color Photograph, Open Ed. 40 x 30 Color Photograph, Open Ed. 16 x 20 Color Photograph, Open Ed. 20 x 24 Color Photograph, Open Ed. Leifer has published 16 books, 9 of which have been collections of his sports photographs. Sports, his 1978 Abrams book, is considered by many to be the quintessential sports photography book. 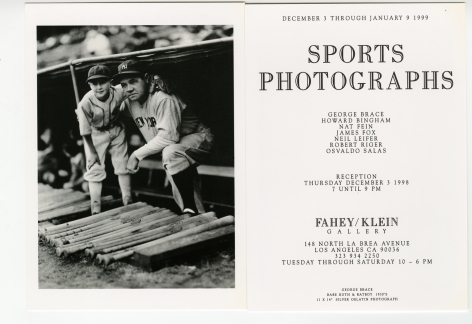 His two most recent, Ballet in the Dirt and Guts and Glory—both published by TASCHEN, showcase the very best of Leifer’s professional baseball and football photographs. Leifer is currently working on his memoir “Relentless” which will be published in 2014.